Sign the petition to FREE PAUL! and move him to the Bangor Waterfront. Print a FREE PAUL! flyer. Read the FREE PAUL! Wicked Haiku. Watch the FREE PAUL! video. 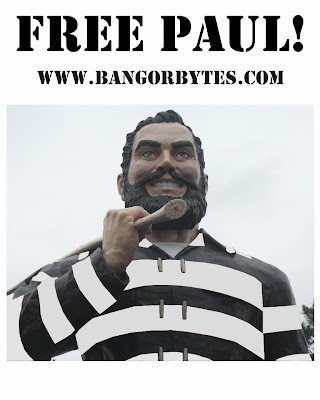 We the undersigned request that the Paul Bunyan statue on Main Street be moved to the Bangor Waterfront. For nearly 50 years, Bangor's 35-foot tall Paul Bunyan statue stood on Main Street overlooking the Penobscot River. Back then, our giant lumberjack smiled upon the Penobscot, remembering a time years ago when Bangor was the lumber capital of the world. Now, this American folklore hero and symbol of Bangor gazes into a parking garage, and his backside is abutted by another large construction, the new Arena. Free Paul from the concrete walls and move him to the Waterfront! With Paul at the Waterfront, he will once again preside over the waters that made Bangor what it is today. Paul will greet visitors and locals as they navigate the Penobscot River, travel across the bridges, relax by the water, or enjoy a concert. The Waterfront location would provide him with higher visibility as well as a picturesque photo opportunity for tourists. We hope that City Council will give Paul Bunyan the space he needs to swing his ax! Please move Paul to the Bangor Waterfront. We thank you for your time and service. Sign the petition! For information regarding your personal information and privacy click here. Print a FREE PAUL! flyer.